Esco Streamline® Pharmacy Compounding Aseptic Containment Isolator, provides a safe and clean environment for compounding of hazardous, sterile drug preparations in compliance with USP 797* criteria. Barrier isolation system provides inherently superior sterility compared to open front clean air devices such as laminar flow clean benches and Class II biological safety cabinets. USP797 guidelines specify that isolators may be situated in an area subject to less severe environmental controls compared with open front clean air devices. When used as part of a system that includes operator aseptic technique training, process validation, expiration setting and product quality maintenance after the CSP leaves the pharmacy, isolators are an effective solution especially for lower-volume pharmacies. They reduce operating and renovation costs, take up less space, and are easier to maintain. 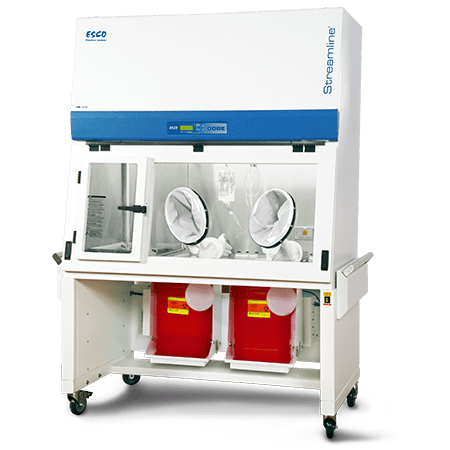 The Streamline® Compounding Aseptic Containment Isolator is suitable for work involving hazardous materials, antineoplastic, or cytotoxic compounding applications. The work zone and pass-thru interchange are under negative pressure to the room in order to maintain operator protection in case of a breach in the barrier isolation system. * United States Pharmacopoeia (USP), Chapter 797(1), enacted January 1, 2004, presents the first enforceable standards for sterile compounding. Following years of patient safety recommendations and professional guidelines, the intent of USP 797 is to set forth the procedural and practical requirements for safe compounding of sterile preparations. The Chapter's requirements are applicable in all practice settings where sterile preparations are compounded. ULPA filters with a typical efficiency of 99.999% at 0.1 to 0.3 microns provide superior ISO Class 3 air cleanliness, 100 times better than competing products. Work zone and pass-thru are under negative pressure to the room in order to maintain operator protection in case of a breach in the barrier isolation system. Robust dual-wall construction. The work zone is surrounded by negative pressure plenums at the sides and back. Unique Esco Dynamic Chamber™ plenum surrounds filter seals with negative pressure. Esco ISOCIDE antimicrobial coating on all painted surfaces minimizes contamination. Esco's Streamline® Compounding Aseptic Containment Isolator is available as a standard bench top unit. Additional accessories are available for further enhancement.